Are you drawn to artistic kitchens? Do you want a one-of-a-kind kitchen that just screams personality? Or are you a quirky person who just wants something a little different that no one else would have the bottle or creativity to dream up? What makes a kitchen unique? It’s the distinctive styles and colours that make it stand out, reflecting the particular tastes of the individual homeowner. How is this achieved? Well, the first step is to pick a theme and work around that. If you love a particular piece of artwork, you can be creative and actually use the colours and patterns the artist used in your kitchen. Some homeowners do exactly that! At Kitchen Design Centre, we have worked with people who have been inspired by the work of certain artists and decided to model their entire kitchen around it. 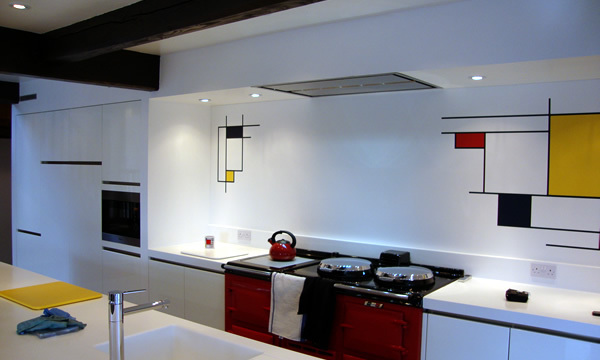 Take a look at one of our designer kitchens, where the famous style of Dutch artist Piet Mondrian has been reinvented. Piet Mondrian is known for his abstract geometric paintings – white backgrounds painted with grids of black lines and bold blocks of colour. You can be really creative with inventive designs like this. Mondrian’s work was built into different coloured pieces of Corian – without compromising its practical qualities in any way. To complete your unique style of kitchen, have you thought about all the different ways that you can design a kitchen to reflect your particular personality? Think about topping it off by accenting your theme with a unique kitchen backsplash made with an unusual material that fits with your specific style.